Leaks on the south side of and underneath the dam at Ocean Beach could lead to an epic fail, causing the lake level to drop 2 and a half feet or more. Consider where the shoreline would move and how the lake would shrink in size. Please thank these people who have contributed to the Dam Strong Fund, enough to cover the expense of the repairs. Repairs will be made by Bendele Construction, and are now schedule for October. The Foundation, a 501(c)3, has accepted funds for this repair work and for other projects that benefit Clark Lake. Donations of any amount are always gratefully received. In view of repair costs, a fundraising effort was launched–The Dam Strong Honor Roll. Suggested giving amounts are each accompanied by Dam Dots. Recently Andy & Candy Willbee and Kent & Marcia Ford, sponsored their 5th Annual Summer Party at Ford Field. Thanks to them and those who attended, $1,900 was added to the Dam Strong Fund. There were many other friends and neighbors who came together to support Dam Strong, including Rob Thomas, Walt & Jean Shuberg, Angel & Jim Dandar, Clarice Kaltinick, Tony Sconochia II, and Daniel & Janice Smith. 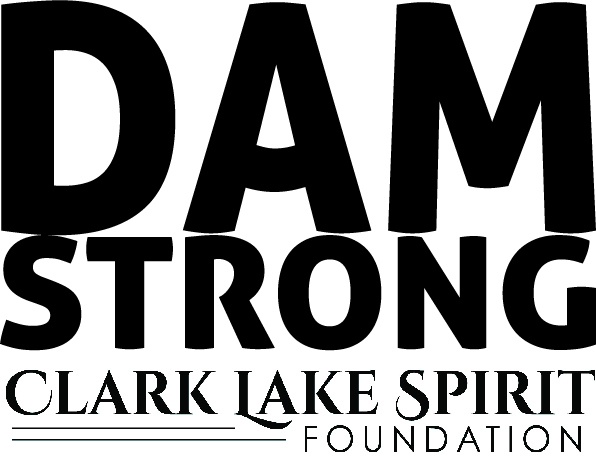 Please enjoy this video–people you may know speak out about Dam Strong.